Below is a sneak peek into USA Football&apos;s Advanced Tackling System, led by Andy Ryland and Richie Gray. The Band Tackle drill is part of the Fight to Connect series. Below you&apos;ll find a description of the drill, what it is used for, and an animation snippet from video content. Traditional tackle drills focus on bags in motion before contact to mimic tracking but provide no counterforce post-contact. In gameday situations, ball-carriers attempt to break tackles, so defenders should be trained to combat that force after initial contact to ensure clamp and grip. Because the bag within the Band Tackle drill can be pulled from the tackler&apos;s grasp, the athletes focus will be on the clamp and grip. Coaches still need to keep a vigilant eye for items such as cleats in the ground (we do not want players to be dragged) and finishing on top in a dominant position. Descriptions for the core coaching points, known as Key Performance Indicators (KPIs) in the Advanced Tackling System, can be found in the section overviews as well as the system&apos;s glossary. Attach a long, heavy elastic stretch band to a tackle bag’s handle. The player starts in a same-foot, same-shoulder pre-contact stance. On the coach’s command, the player jabs with the shoulder and punches with the arms to secure the tackle. Good clamp, grip and arrowhead. Meanwhile, the coach pulls on the stretch band, challenging the player to maintain squeeze and arrowhead, keeping cleats in the ground all the way to the ground. 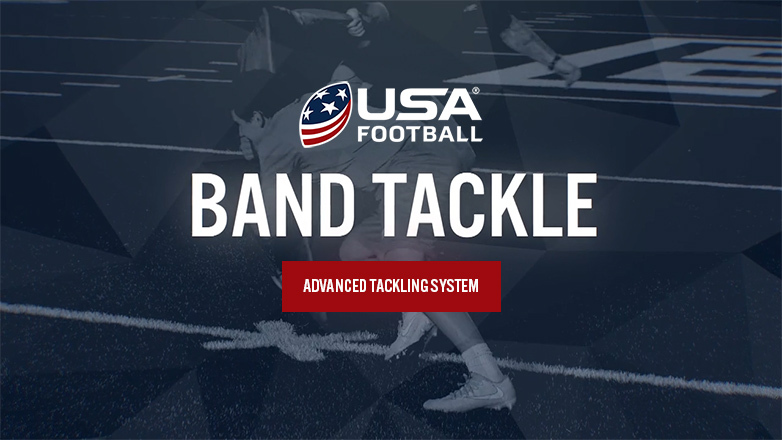 The Advanced Tackling System instructional materials cover the Band Tackle drill -- and every other tackling drill -- in significant depth. Drills often fall underneath the Install aspect of our systems, helping you build the skills necessary to properly use any one of USA Football&apos;s Systems.